If you do NOT have a cheque, you can locate your account information in Easyweb on the Accounts screen by selecting your account. The first set of numbers (4 digits) is your branch (transit) number. The second set (7 digits) is your account number. Your branch transit number is a 5-digit number comprised of your 4-digit branch number, followed by a number indicating the geographical location of your branch. Nova Scotia, Prince Edward Island and Newfoundland (excluding Labrador): 3. The financial institution number for TD Canada Trust is 004. 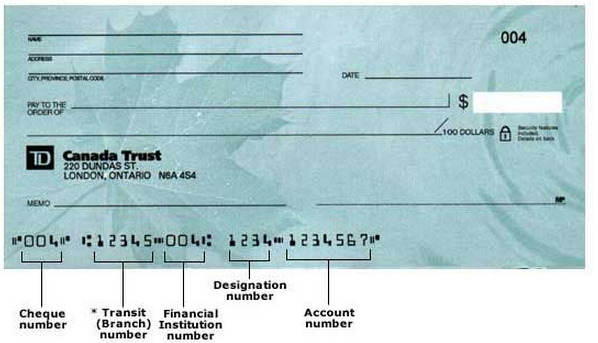 The designation number helps us know which branch the cheque is related to. Designation number is generally 4 digits, which is your TD branch location number, and then an extra digit to represent the province. If your account number only has 6 digits but a form requires 7, simply add a 0 to the start. For example, 123456 is 0123456. How do I set up a pre-authorized payment? How long does a wire transfer take to be processed? How do I receive a wire transfer to my account? What is your institution number? How do I deposit funds to my account in Canada while overseas? What accounts are available in mobile banking? How do I view the status of a TD Bank (US) to TD (Canada) Transfer? Where can I find career opportunities? Have a question about Transfers?